Euan Dangerfield, client director at Cazenove Capital in the Channel Islands and responsible for the business development there, has continued to welcome a steady stream of new clients since the merger. ‘Since merging with Schroders, new business enquiries continue to remain strong and our investment portfolios are performing well,’ he says. It’s good news for the wide range of HNWs he advises. If clients were going to be losing their hair after the Brexit vote, the good performance of the stock market has reduced that worry, he adds. ‘Markets have performed well since the vote, and that seems to have stemmed any real concern among our clients for the time being.’ Dangerfield joined Cazenove in 2011 from consulting firm ARC, who research industry benchmarks for wealth management portfolios. Since 1993, he has built up a broad experience serving the investment needs of individuals and trustees. 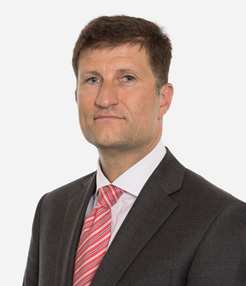 He has previously worked at RBC in London and for HSBC and Hill Samuel in Jersey. He’s also worked at Mourant Client Treasury Services and Midland Bank Fund Managers. He is a Chartered Fellow of the Chartered Institute for Securities & Investment. Cazenove’s Jersey wealth management business is one of the leading advisers in specialist financial solutions to private clients, family trusts, companies, charities and pension plans. Dangerfield and his team of experienced advisers offer personal service and tailor-made wealth management solutions to a discerning clientele. This includes personalised discretionary and advisory investment services, wealth planning, cash administration and specialised lending. Dangerfield’s team focuses on growing and preserving wealth, and takes advantage of Schroders’ investment products and a range of external funds to structure clients’ portfolios. He is proud of the firm’s dedication to maintaining the quality of private client relationships, and calls it a powerhouse with the ‘stability and depth of investment resource of the Schroder Group’.